Located close to Red Feather Lakes village in trout-fishing country, Beaver Meadows Resort Ranch's rustic charm and secluded location nestled next to the hills of Roosevelt National Forest make it an ideal location for destination weddings in Northern Colorado, or just a retreat with friends and family. The River Valley Venue has some quaint bridges and ponds for photos, so the opportunities for a variety of photo locations are plenty. 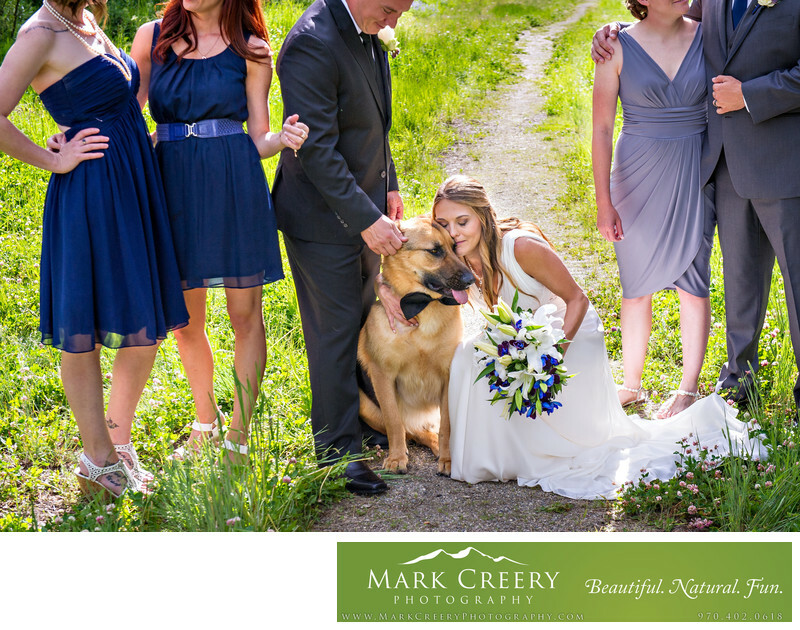 In this photo, the couple's dog got involved in the bridal party photos. He even had a cute bow tie on! I love that this image shows the strong bond between them in a candid moment where the bride bent down to give him a hug and kiss with the groom looking down. Also the other bridal party members are looking at each other and connecting as well. Location: 100 Beaver Meadows Place, Red Feather Lakes, Colorado, 80545.